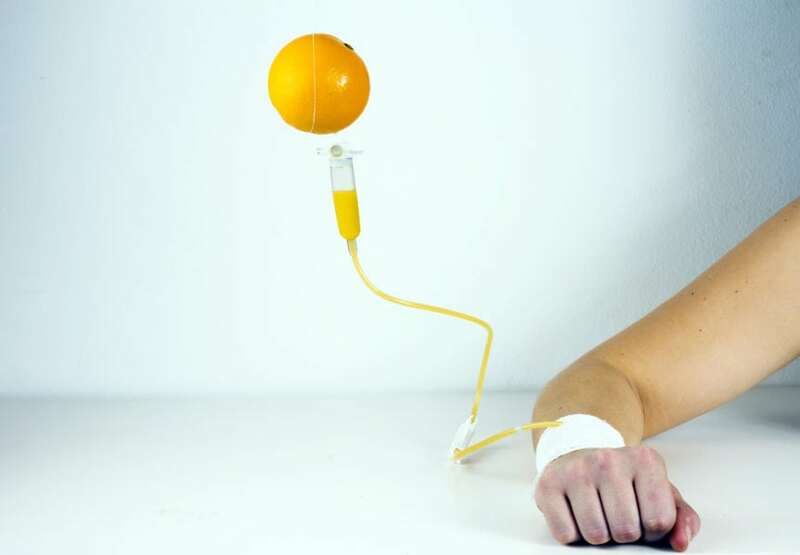 High Dose Intravenous Vitamin C (IVC): Kills Cancer! “If you feel a cold coming on, take your vitamin C!” There has been a long-held belief that vitamin C (in the form of supplements or food) will prevent the common cold or shorten the duration and decrease the intensity of an illness. This belief was thrust into the mainstream by Linus Pauling who fought tooth and nail (and by the way, vitamin C can help with your teeth AND nails) to defend his research linking higher intake of vitamin C consumption, beyond what is necessary to prevent scurvy, and a more robust immune system. Without him, many of the advances that we have seen in the world of immunology and alternative cancer therapies would not have been possible today. Vitamin C, or ascorbic acid, is one of the most important antioxidants and immune boosters in the body. Because our bodies are not able to manufacture this vitamin due to a gene mutation, it is required to obtain vitamin C from our diet on a daily basis. Some of the best known sources of vitamin C include citrus fruits, most berries, watermelon, tomatoes, peppers, broccoli, cauliflower and brussels sprouts. Vitamin C has hundreds of functions in the body including collagen synthesis and repair, assisting in neurotransmitter production, as a free-radical scavenger, helping to absorb iron and, most pertinent to this article, in aiding the body’s immune response. Why Can’t We Just Take Megadoses of Vitamin C Orally? When we take in vitamin C orally, our bodies normally absorb it through the small intestine, where the majority of nutrients are absorbed. When taken orally in higher amounts through “mega-dosing”, these dosages are often ill-tolerated and the result can be uncomfortable gastrointestinal upset, gas, bloating and diarrhea. However, high-dose intravenous (directly into a vein) vitamin C (IVC), meaning vitamin C infused directly into the body through an “IV infusion”, bypasses the gastrointestinal tract completely and these side effects are mitigated. When comparing the absorption of oral and IV vitamin C, IV vitamin C is far superior in that not only can more vitamin C be tolerated at any one given time, but it can raise serum levels of vitamin C some 350-400 times higher than oral vitamin C! How High of a Dose is High? The maximum dosage of oral vitamin C that a person can usually take in before unwanted gastrointestinal side effects occur is about 8 grams (8000mg). This would equate to about 8 packets of the very popular Emergen-C vitamin packets. However, the maximum dosage of vitamin C that can be done at one time, safely, using high dose IVC is 150 grams (150,000mg). Yes, you read that right! You can take in 150 grams all at one time (granted over about a 3 hour timeframe)! This poses a HUGE advantage from a therapeutic standpoint to help patients dealing with numerous health conditions. The typical high dose IVC treamtent usually is in the 50 – 100 gram range and takes anywhere from 1-3 hours to administer. What Conditions can High Dose IVC Help? High dose IVC has been used for many decades and has many clinical applications. Some of its best known usages include: treating or preventing the common cold or flu, aiding in tissue repair in poor/slow healing or after acute or chronic injuries, improving adrenal fatigue and helping the immune system fight chronic infections, like Epstein-Barr Virus (EBV) and hepatitis. Now, thankfully, it is gaining popularity amongst many integrative practitioners as an adjunctive treatment for many different forms of cancer. There have been many positive research studies conducted and many more major studies underway funded by larger institutions looking into the efficacy of high dose IVC in eradicating cancer, improving quality of life and extending life in sufferers of cancer. High dose IVC has also been shown to greatly mitigate many of the unwanted side effects of chemotherapy and radiation and actually make many chemotherapeutic agents more effective with less agent needed to exact the same effects on cancer. How Does High Dose IVC Kill Cancer? First, vitamin C activates specialized immune cells called natural killer cells (NK cells), T cells and B cells to aid in fighting “bugs” and cancer cells. Vitamin C supplementation has also been shown to regenerate production of these cells in the bone marrow following administration of chemotherapy. So often is the case where individuals undergoing chemotherapy and/or radiation for cancer treatment end up with secondary infections as a result of decreased production of these very important immune fighters. Secondly, many different types of cancer cells lack a specific enzyme called catalase. Catalase helps to break down hydrogen peroxide into water and oxygen. Human cells are readily equipped with this enzyme. When large amounts of vitamin C are infused into the body, vitamin C enters both cancer and healthy cells. A large hydrogen peroxide burst ensues inside the cell. Healthy cells are not affected because they have catalase and can break hydrogen peroxide down into water and oxygen. Cancer cells, on the other hand, are damaged and die from the high hydrogen peroxide levels they are unable to metabolize. In our clinical experience and the research that now supports these findings, high dose IVC is effective at improving the outcomes for patients with cancer and enhancing the efficacy of conventional treatments when done alongside high dose IVC. Many conventional doctors still remain skeptical as to the effect of high dose IVC on eradicating or slowing the progression. Some studies have shown a slower progression of disease while others have shown that vitamin C mitigated the severity of the side effects of chemotherapy, that often are numerous and debilitating. A recent study in in the journal Cancer Cell found that high dose IVC extended the lifespan by 4-6 months in 11 patients with glioblastoma, a form of brain cancer, who were also receiving chemotherapy. Similar findings have also been demonstrated in patients with colon cancer and pancreatic cancer, often diagnosed with a dismal prognosis and poor survival rate. One case report (2018) showed survival of 4 years in a patient with stage 4 pancreatic cancer, the most severe form of this disease. Other forms of cancer that have been shown to respond favorably to high dose IVC include breast cancer, prostate cancer and ovarian cancer. Researchers from the University of Kansas Medical Center showed that high dose IVC alongside chemotherapy helped kill cancer cells while reducing the toxicity of the chemotherapeutic drugs in some of the participants of a 2014 study. In a 2017 study, high dose IVC reduced levels of PSA and alkaline phosphatase, two markers almost always often elevated in aggressive prostate cancer and the latter seen in metastasis (spreading) of prostate cancer to the bone. Overall, we have seen high dose IVC slow the progression of or eradicate cancer and prolong and improve the quality of life in patients with cancer. We are so happy to see the positive research on high dose IVC now being conducted and are confident that many, many more studies will coming to the public in the future as it gains more notoriety. This amazing modality has the potential to help so many people, not just with cancer, but so many other chronic conditions too. As part of an individualized, comprehensive naturopathic treatment regimen, high dose IVC is very often just one component of a protocol for our patients struggling with cancer. Dietary interventions, botanical medicine, other intravenous nutritional treatmentsand metabolic therapies, like hyperbaric oxygen therapy (HBOT), are also considered. Schoenfeld et al.Cancer Cell.2017; 31:487-500. Drisko et al.Anticancer Drugs.2018 Apr; 29(4): 373-379. Ma et al.Science Translational Medicine. 2014 Feb; 6(222):222ra18. Brain Not Working?? Biofeedback to the Rescue for Your Brain Fog!